Kalawati comes from a family of small farmers. Hers is a 'joint and happy family' where she lives with her husband, 1 daughter, 2 sons, 1 daughter-in-law and 1 granddaughter. Her postgraduate sons working outside the village are doing fairly well and have helped her construct their own house in the village. Kalawati has been into farming for the last 30-35 years since her early childhood. Besides tending to her crops and doing all the labour intensive work (like sowing/growing of vegetables, mustard, gram wheat, paddy, sugarcane, and cutting of sugarcane), she also tends to her cows and buffalos, with very little help from her husband. While the grains she grows are consumed in the family, she is able to earn money through sale of buffalo milk. Kalawati concedes that there is a lot of difference in today's farming as compared to earlier days. Earlier there was no proper arrangement of manure and watering the crops. Now things have improved drastically. With better availability of manure and water and improved farming techniques, the crop yield has increased. 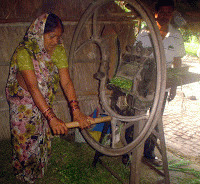 Kalawati is an elected member of the panchayat (village council) and also an active member of Aaroh Mahila Kisaan Manch ('Aaroh' is a campaign for rights and recognition of women farmers in Uttar Pradesh supported by Oxfam India), where all women farmer members work together to improve their farming skills. She has been part of this Manch since the last 10 years. She loves to take part in their meetings and rallies and raise slogans like (we the women of India are sparks and not flowers). Other women labourers/ farmers look upon her as a sort of leader. If there is some work involving farm labour - like sugarcane cutting - women workers contact her because of her ability to negotiate for better prices. Then she arranges for a group of women to do that work and distributes the money as wages among them. Realizing their utility for poor women, Kalawati has formed a women's self-help group (SHG). According to her, "SHGs are really very helpful for women like us. I remember once in the early days, I borrowed INR 500 from someone, as a friend of mine was in need of money. I was told to return the money in 10 days and also had to work in their fields to cut paddy (for which I did get paid). This happened with many of us. So I started a group with 7 members. Currently we have 14 members and each member contributes INR 50 every month. The group is now 4 years and 8 months old and today we have INR 35,000 in the bank, which is a big boon for all of us in times of need. We can get loan from the bank at low rate of interest. This money we can spend on farming related expenditure--manure, irrigation and seeds; or for buying livestock; or to meet some emergency expenditure. I took loan of INR 10,000 to get a linter for the roof of my house. One member took INR 6000 for house repairs, while another borrowed INR 10,000 for a wedding in her family, and both returned the money with interest. There has never been any default payment till now. Every month we hold a meeting where we make a resolution, go to the bank, withdraw the money and then give it to the woman member who had asked for a loan. I am running this group myself. In case of a problem we go to the block level". Kalawati is not aware of any government scheme for the benefit of small farmers like her. According to her, it is the big farmers who avail of all the benefits. "I have never got the benefit of government schemes. We do not even come to know when seeds and manure come for distribution, as whenever we go and ask for them we are always told that the stock is over. The last time it happened was in September 2014, when people from the agriculture department had come and distributed it. I am not aware that harijans (scheduled castes) like us are also eligible to get anything from the government. Nothing is free for us. Of course things are much cheaper if bought from the cooperative society but that is not for us. We buy whatever little we can from the private market". Kalawati says that one has to pay bribes to get even a labourer's job at INR 100 per day in the village, and that too after much difficulty. She is also skeptical about other government facilities for the poor. Even though she is entitled to get medical facilities at subsidized rates in the hospital, when her daughter was sick and admitted in the hospital, she spent around INR 15000 but was reimbursed only INR 6000.